Are you looking for a reliable online gift shop, which makes sending of gifts to your desired destination an easy task? Shower your loved ones in Mysore with special gift hampers that will leave them surprised. Mysoregiftsflowers is an amazing shopping store delivering online gifts in Mysore, we are known for convenient and easy online shopping experience. Online shopping is an easiest way to get perfect products of your choice, these services provide you to make someone special feel happy. Customers looking for safe and timely delivery of cakes to Mysore can approach us anytime and from anywhere of the world. Gift giving is a universal way of showing love and affection towards your family and friends. 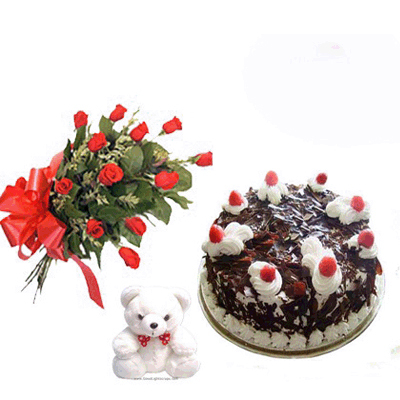 We are an online gift portal allowing you to send cakes to Mysore on Christmas, Valentine’s Day etc on the same day. If there is any party, anniversary, new born baby celebrations, birthday or any occasion coming up, online gift hampers prove to be the best gifting options. Our professional local vendors are always ready to deliver online gift hampers to Mysore, on your desired date to your preferred locations. Spend some time on our e-commerce site and get the exact gift, for your relatives and friends on their most important occasions of life. Exchanging gift hampers with people living in Mysore, on festivals and other auspicious events is the present trend. We as an online service provider provide delightful experience, on our site with hassle free online payment solutions and good user interface. 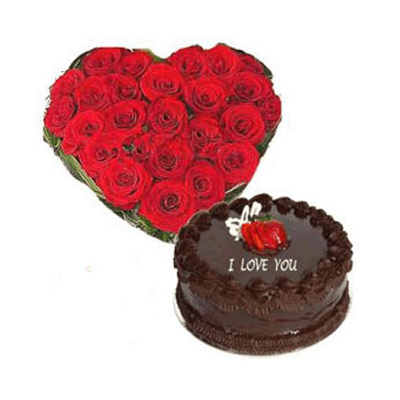 Send cakes to Mysore on special moments such as missing you; Love you, sorry or just like that with Mysoregiftsflowers. We ensure you will never be disappointed; our prompt services will always give you pleasurable experience. Let’s face the fact there is no better and simple way of shopping then to shop online. 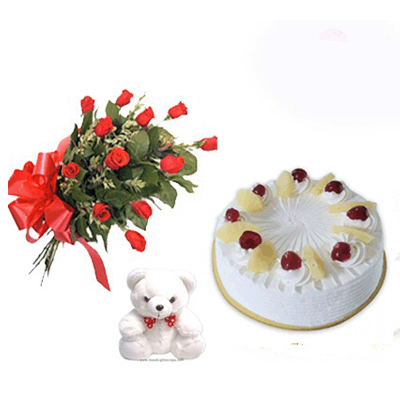 We make you send gift hampers to Mysore on any occasion you want with complete care. Most of the people find it convenient to sit at their home and send cakes to Mysore to their loved ones, there is nothing precious than the smile of your loved ones. Take our services to send love and good wishes to your dear ones. Delight your special people with 10 bright red dutch roses, 1/2 Kg pineapple cake and a cute teddy bear on special occasions. A beautiful basket of 12 orange roses, cadbury celebration chocolates and 6" teddy bear is the perfect gift to make an occasion special for the one you love. 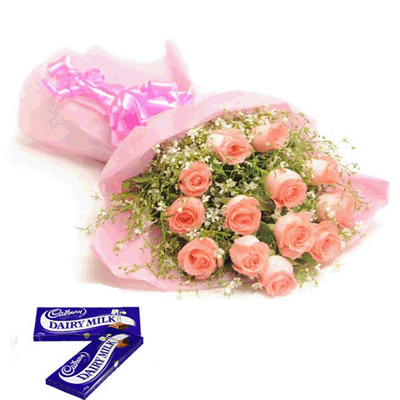 Surprise your loved ones with 12 beautiful pink roses wrapped in pink jute and 2 cadbury dairy milk bars on special moments of life. 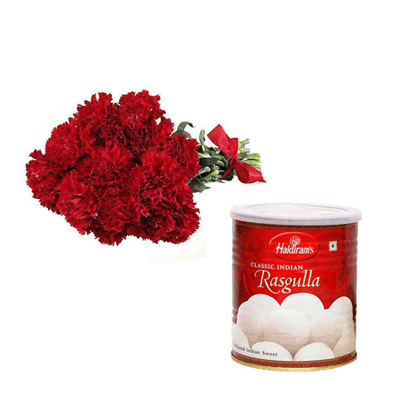 Every occasion is made special, with a 1 Kg tin of fresh Rasgulla and a nice bunch of 10 red carnations. Make your loved ones day with these gifts on special occasions. Want to make someone feel happy. 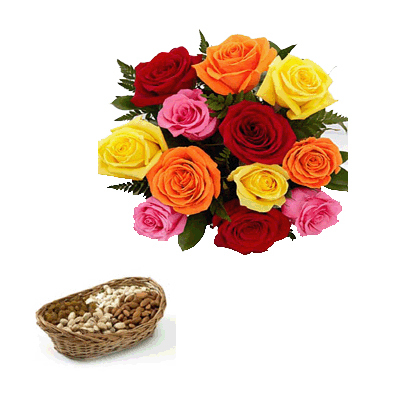 Send a cane basket filled with 500 gms dryfruits and a bunch of 12 fresh mixed roses to make someones day. A 6" teddy bear, 1/2 Kg black forest cake and a beautiful bunch of 12 red roses will make your loved ones special day even special. 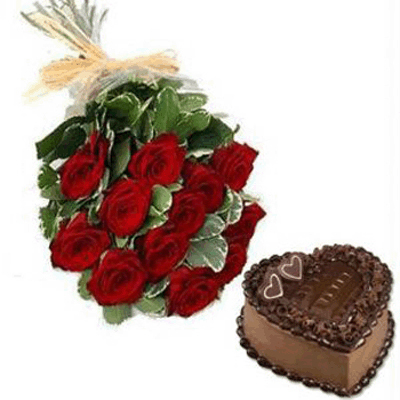 Gift your loved one a combo gift hamper of 1 Kg heart shaped cake and lovely bunch of 12 red roses. Say you love. 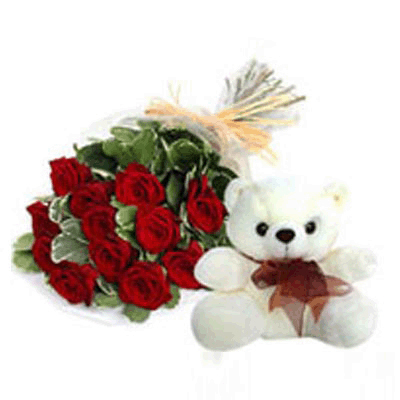 With a bunch of 12 red roses and a cute teddy bear for someone special on special moments of life. 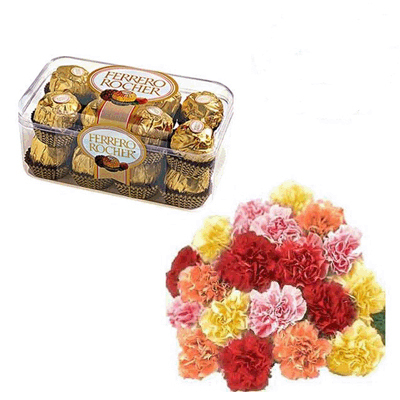 Make your loved ones day special with a basket of pink carnations and a box of 16pcs fererro rocher. Send a combo gift hamper to someone special on special occasions. 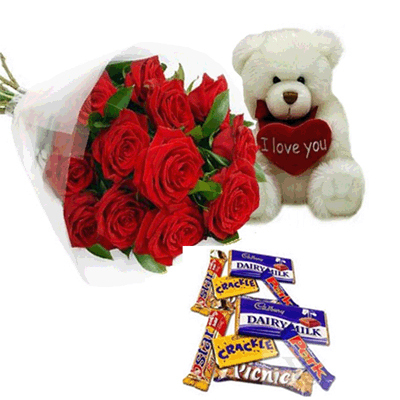 Gift 12 red roses hand bunch, 7"-9" white teddy bear and 6 bars of assorted cadbury chocolates. Cheer your special friends on special moments.100ml Charlie perfume, 1/2 Kg chocolate cake and 12 red roses bunch would bring a smile on their face. 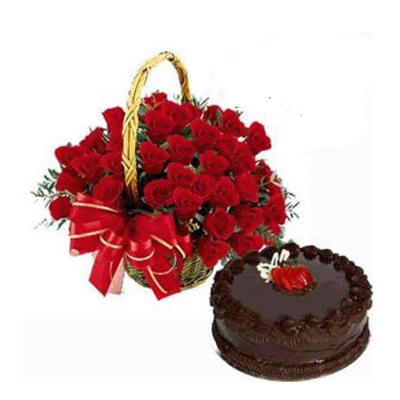 Gift a huge basket of 60 red roses and 1 Kg heart shaped cake, to someone special on special occasions. 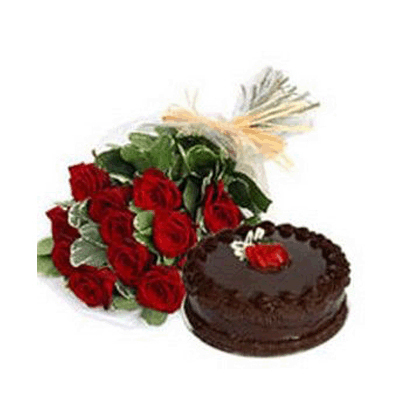 Delight your loved one with 10 beautiful red roses bunch and 1/2 Kg chocolate cake to make the occasion even special. 40 red roses arranged in heart shape and 1 Kg heart shape cake. A perfect gift for someone you love. Want to make your loved ones day special? 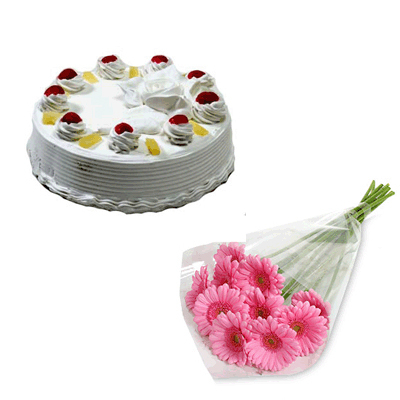 Then send a bunch of fresh 10 pink gerberas and 1/2 Kg pineapple cake, to make your loved ones day special.